Over the past month, Tally seems to have outgrown her dairy intolerance, and real ice cream is once again part of my life. Ice cream is my favorite dessert (just barrrrely edging out cookies), so I’m really happy to have it back on the table. And once ice cream was an option again, I realized I hadn’t used my ice cream maker since we moved to Arizona two years ago. I blame our freezer, mostly. Because of the layout of our kitchen, we bought a counter-depth fridge so that we could actually open the dishwasher. Which is great for using the kitchen, but means that our freezer is tiny. Bart and I have been meaning to buy a second freezer since . . . August of 2015, but haven’t. So our freezer space is very tight and usually doesn’t have room to put the ice cream canister in there to freeze. But once I could eat ice cream again, I was dying to make some homemade ice cream and so I moved heaven and earth and frozen chicken breasts to make room for the ice cream canister. 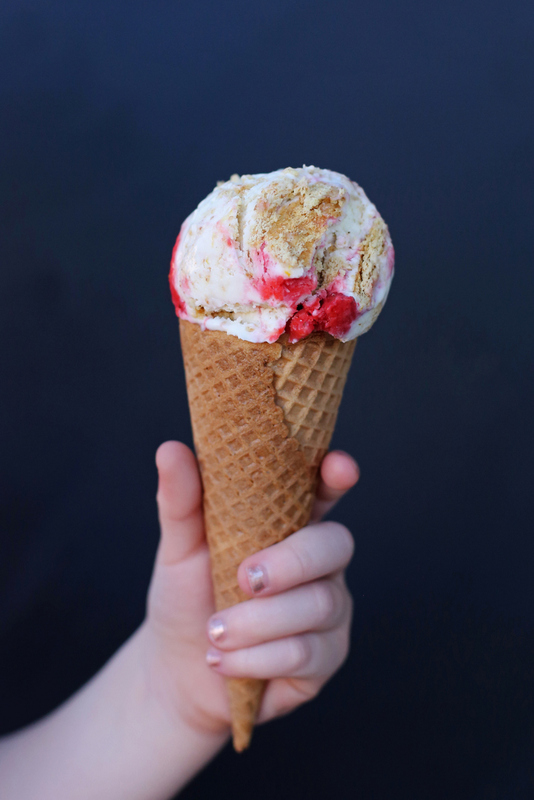 Ella and I made this strawberry cheesecake ice cream together a few weeks ago when she had a half day of school and it turned out amazingly well. It might be the best homemade ice cream I’ve ever made. Because I wanted us to be able to make the ice cream from start to finish in one sitting, I used sweetened condensed milk (I used the Eagle Brand – this isn’t a sponsored post, but I did meet them at Mom 2.0 earlier this year and they gave me a couple of free cans of sweetened condensed milk). Usually, you have to cook the sugar and milk or cream together to get it to dissolve, which then means you have to chill it, and using sweetened condensed milk means you can skip that step (and save yourself a few hours). Also, my biggest pet peeve with homemade ice cream is when it has that coat-your-tongue quality, like you’re eating straight whipping cream, and this one doesn’t have that all. 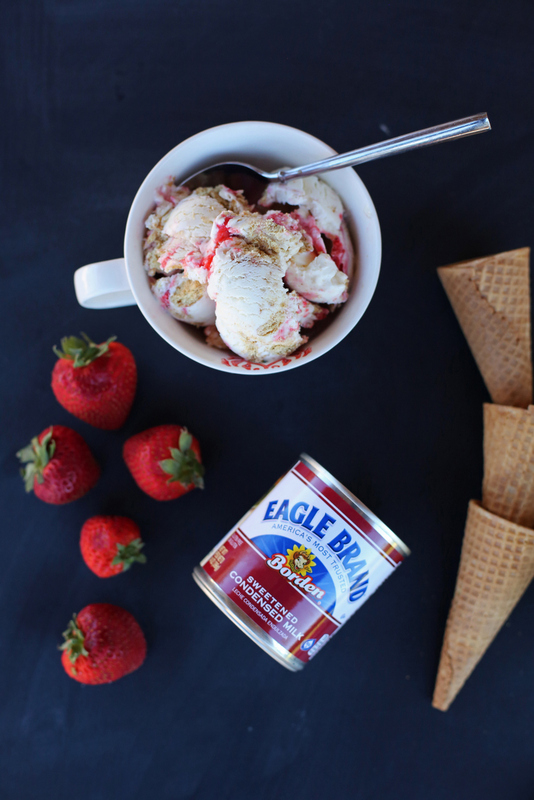 This is the perfect end-of-summer recipe, so if you’re looking for a delicious treat for the Labor Day weekend, this strawberry cheesecake ice cream is a winner. 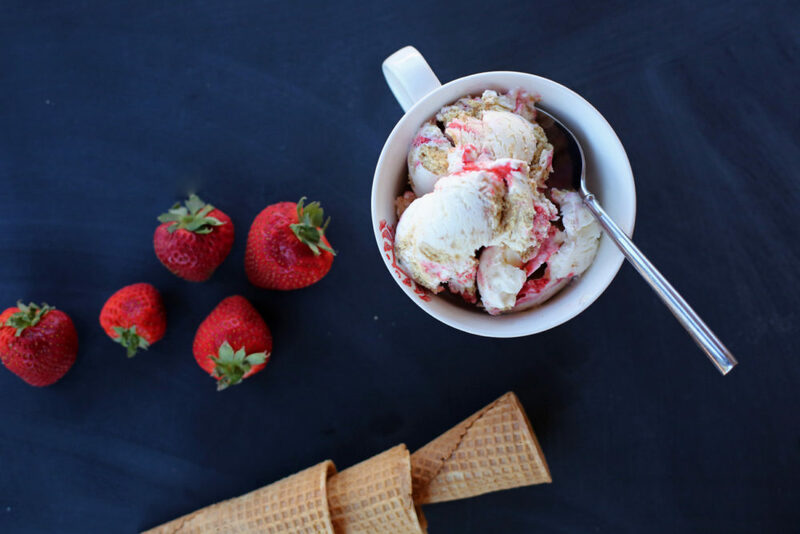 This creamy strawberry cheesecake ice cream is easy to make and stuffed with delicious add-ins like crumbled graham crackers and a tart strawberry fruit swirl. In a small saucepan, cook the strawberries, lemon juice and sugar together until it comes to a boil. Reduce heat to low and simmer about 5 minutes until thickened, stirring occasionally. Set aside to cool. In the bowl of a stand mixer, beat the cream until stiff peaks form. Add the cream cheese and continue to beat until well combined and the cream cheese is smooth. Add the sweetened condensed milk, lemon zest, salt and vanilla and mix until smooth. Place the strawberry mixture in the fridge to cool. Pour the ice cream mixture into a ice cream maker and mix according to manufacturer's directions. 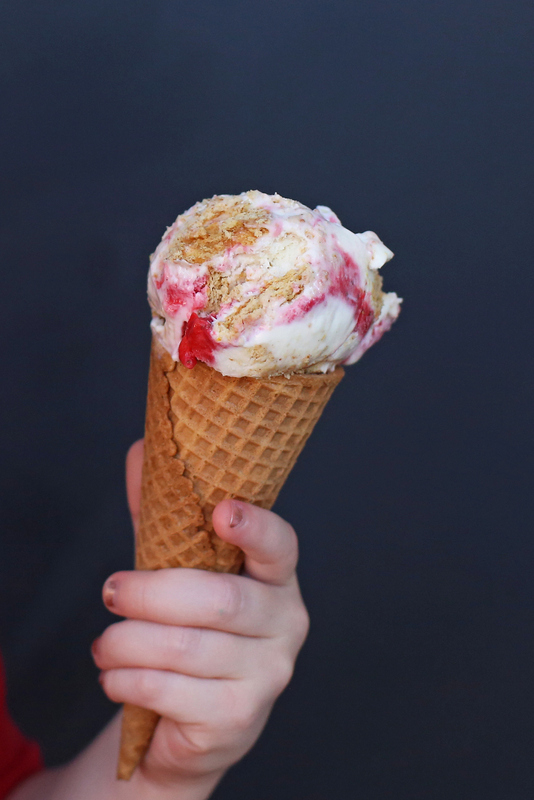 When the ice cream is finished, transfer it to a freezer-safe container and gently stir in the crushed graham cracker pieces. Drizzle half of the strawberry mixture over the ice cream and swirl in with a knife or spoon. Repeat with the other half. Freeze until hardened, about 4 hours or overnight. Enjoy! This looks so yummy! And I’m glad to hear that your dairy hiatus is coming to a close! I wouldn’t last! I make a lot of homemade ice cream (I’ve been posting one a week to my blog all summer, for 3 summers now) but I’ve never made this one! And the one cheesecake recipe I have made I didn’t care for. Will try this one! 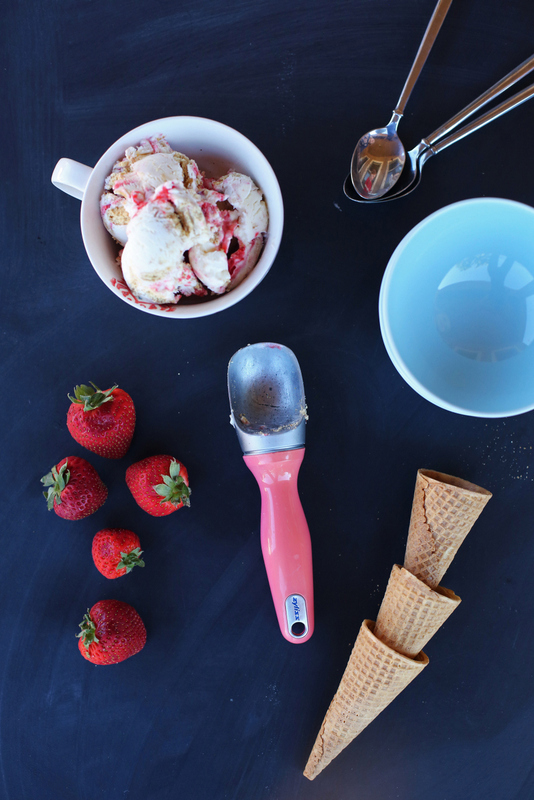 I have no ice cream maker, but this recipe uses my base recipe for no churn homemade ice cream. 2 cups whipping cream, whipped with a dash of vanilla. Fold in a can of sweetened condesned milk and some cut up candy bars (reeses are our favorites), freeze for 6 hours, and you have creamy and amazing homemade ice cream.